There have been many changes since then and a whirlwind of drama surrounding the Nuggets. For those of you who think that it is unavoidable that Carmelo Anthony will take his game elsewhere… this post may not be for you. 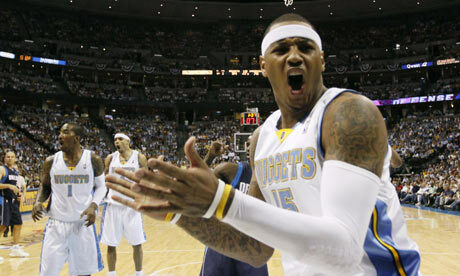 I am going to hold on to any hope, and a few bias theories, that have him wearing a Nuggets uniform beyond this season. As we all know, the only team that has not been linked to a possible trade for Melo is Besiktas (the Turkish team that signed our old friend Allen Iverson). We have been enduring the speculation for far too long now and frankly, I can’t wait for the season to start so we can clear things up. It is time for Chauncey to rally the troops and start the season with a bang. This will be the first step to convincing Melo to stay. J.R. Smith needs to live up to all of the reports that he has developed a mid-range game and has made enormous strides in his personal maturity. The sixth man award is his for the taking if these reports are indeed true. Nene is healthy and needs to realize that he is often the strongest player on the court and play like the beast that he is. The true key to the season, however, is the simple fact that Arron Afflalo will establish himself as the second best player on the team. His perimeter defense can hold the league’s best wing players at bay and his ever improving jumper will prove to be the bane of any opponents existence. When he can stifle players like Kobe Bryant then come down to the other end and shoot 47.6% from beyond the arch, this year poises to be one of epic proportions for this young man. Just remember where you heard it first. With the injuries to Kenyon Martin and Chris “Birdman” Andersen, Al Harrington has a tremendous opportunity to earn the starting power forward role for the entire season. He is a gifted scorer who has never had the luxury of being the fourth scoring option. If he lets the game come to him, he is bound to make a positive impact. He can stretch the opponents defense, which will open lanes for Melo, Chauncey and J.R. to slash. The better Al plays, the easier it will be to properly nourish KMart and Birdman back into the lineup. Another opportunity is that of Ty Lawson. He is fortunate to have the wisdom and leadership of Chauncey. Ty has only scratched the surface of his potential thus far. He has established himself as one of the fastest players in the league and instills fear in defending 7 footers (just ask D.J. Mbenga). Ty needs to keep absorbing and learning the tricks of the trade and he will be on the fast track to success. To round out the lineup, we have acquired Candice Parker’s husband (Sheldon Williams) who has hopefully harnessed some of her talent. He and Renaldo Balkman will battle for limited minutes even with the plethora of injuries to the front line. Gary Forbes and Melvin Ely will look to earn a spot at the end of the bench with their play in garbage time. And then there is Anthony Carter. It will take a lot of hard work and due diligence but if the Nuggets can ignore the turmoil of the rumor mill, they can make a real statement in the unpredictable Western Conference. Carmelo Anthony will have an easy choice to sign the extension that is on the table and ultimately bring a championship to the great city of Denver.